The small flame light stands 1Ft. tall and is suitable for table tops. 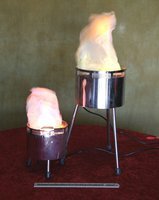 The larger flame light is 2Ft tall and is more suitable for floor standing. Great effect very eye catching. Looks good on a bar or buffet table.